As employee in a software company, I have been given the task to add features to an old-fashioned WIN32-based software program. Since last year I have been using almost exclusively latest technologies including .NET, and ironically only to fall into projects dealing with 10 years old technologies. Oh my goddish! 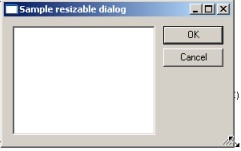 So I have been facing WIN32 dialogs, global callback-based procs that do not natively provide a way to be resized on will, and I find very poor the fact that WIN32 dialogs cannot host ActiveX controls either. All of this seems to me like using prehistoric tool for todays' business needs. And don't get me started on ergonomic UI. These amazing limitations have allowed poor boss technical decisions like using VB instead of C++, opening path for blood. If you need to process some dialog messages, just add an entry to the message map macro, and provide a handler to it. In case you are interested in some notification messages instead, use the NOTIFY_HANDLER(control_id, notification, func) macro. Look atlwin.h for further info. 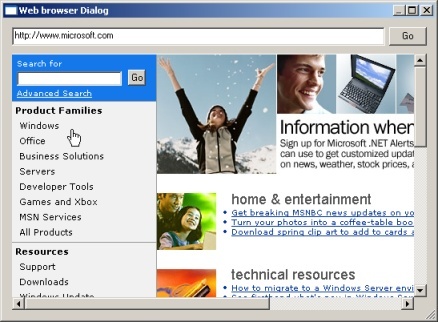 Doing so, we are provided with the entire object model in the Debug\msdxm.tlh + msdxm.tli files. It's such that if you take a few minutes to browse it (I know this is rude! ), you'll figure out there are coclasses and interfaces. Coclasses are entry points when we need to create new instances, while interfaces are binders we can rely on. On the other hand, the ATL CAxDialogImpl inherits lower level classes, one of which exposes the GetDlgControl(int nID, REFIID iid, /*out*/void** ppDispatch) accessor, giving us a handy way to bind the interfaces with the running player instance (inserted in the dialog's .rc file as described above).